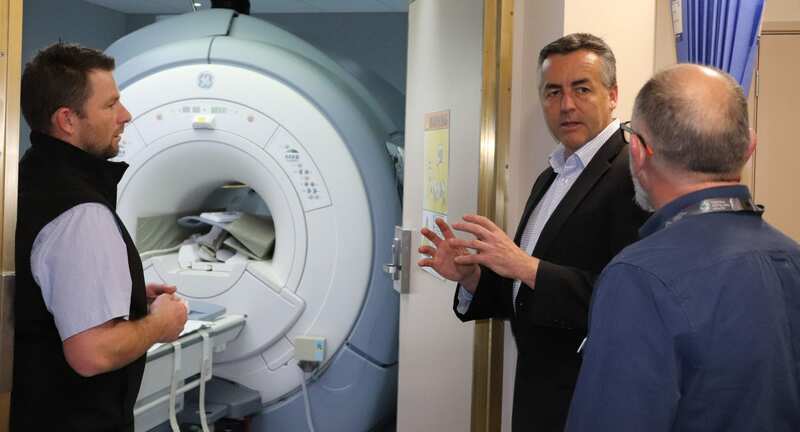 The Federal Member for Gippsland Darren Chester is pictured in front of the MRI machine at Sale hospital with head of medical imaging Simon Waixel (left) and CGH Chief Executive Officer Dr Frank Evans (right). Demand for medical scans at Sale hospital has been strong since Central Gippsland Health (CGH) was named among 10 Australian locations newly licensed to conduct Medicare-subsidised MRIs. Patients needing an MRI scan for cancer, stroke, heart and other medical conditions have been able to undergo a subsidised procedure at the hospital since November last year. Federal Member for Gippsland Darren Chester secured the listing for CGH and said he was happy most available appointments were taken each day, without a long waiting list. “Around 3000 MRIs are predicted to be performed at Sale hospital annually. Of those, around 2,500 are expected to be for patients who will receive a Medicare rebate,” Mr Chester said. “The most frequent scans conducted so far are of the brain, spine, knees and shoulders. Understandably, patients are happy they can get a bulk-billed scan without travelling to Traralgon or Bairnsdale. MRI, or Magnetic Resonance Imaging, uses magnetic fields and signals to create images of inside the body. An MRI gives a detailed view of soft tissue such as muscles, ligaments, brain tissue, discs and blood vessels. It is used to diagnose and monitor medical conditions including cancer, trauma and sporting injuries. CGH Chief Executive Officer Frank Evans said the ability to now bulk-bill specific MRI scans was a step towards ensuring every person had access to quality medical care. “Due to smaller populations, larger distances between towns and fewer technical resources, rural and regional health services face a number of different challenges from those located in the city,” Dr Evans said. “Limited and shared resources between towns mean not all medical services are available all the time. In a rural area, you may often have to wait until a specialist is in the area or travel to a regional or metropolitan hospital for more complex diagnosis and treatment. The MRI is operated by two staff members from 8.30am to 5pm. If the waiting list grows, the operating hours could be extended. Patients must obtain a referral from their GP or specialist to have an MRI. Some patients may can only get a Medicare rebate with a specialist referral. To check if the referral will be covered by Medicare, patients should contact the X-ray department on 5143 8620.